He’s been here for less than a semester and has already had to make decisions many executive vice presidents and provosts of universities across the nation rarely face. But Jeffrey Duerk, the University of Miami’s new executive vice president and provost, isn’t fazed. Duerk said his first few months in the position are even better than he imagined. Within the first few weeks of his tenure, Duerk and his colleagues faced one of the biggest storms recorded to hit South Florida, Hurricane Irma. He said even before he arrived at UM, he had thought about the possibility of dealing with a hurricane, something he had never faced before. However, he said he knew he, along with President Julio Frenk and other administrative staff, had to be decisive. Even though he would describe the beginning of his tenure as a “fast-paced roller coaster ride,” Duerk said he is most impressed by the students. Duerk succeeded former provost Thomas LeBlanc, who left UM this past summer to become president of George Washington University. Duerk was contacted by the university as part of the provost search process in late February. Duerk said he missed the initial email that was sent to him from the university because his father had just died and his brother had had a stroke a few days later. However, about a month later, after sending his resumé and other supplemental materials, Duerk visited the university for the first time. He said he was surprised the first person he met before his interview was his future boss – President Julio Frenk. 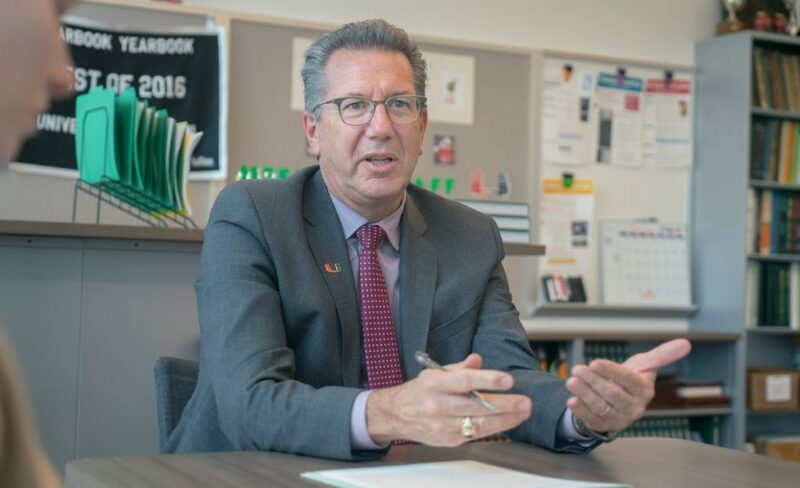 After a second round of interviews during commencement week of the spring 2017 semester, Duerk received a phone call from Frenk offering him the position. From his initial interview to the moment of the offer, it had been one month. Many searches can last up to a year. Dr. Eduardo Alfonso, director of the Bascom Palmer Eye Institute, chaired the 16-member search committee that recommended Duerk as one of the finalists. Now, Duerk walks the same halls as his predecessor with a new vision for the university. “Just a few months later, it’s hard to imagine more can happen in somebody’s life in a shorter period of time because I gave up a position at a university I was at for 30 years,” Duerk said. Duerk joined Case Western’s faculty in 1988, where he served as the chair of the departments of radiology and biomedical engineering as well as the founding director of the Case Center for Imagining Research. In 2012, Duerk was appointed the dean of the Case School of Engineering. At UM, Duerk’s future plans include the creation of a “think tank” on undergraduate retention. He said he wants to collect data on retention rates, then create thinking exercises and a task force to produce results on improving the rates.